This site features the top 11 diamond topics. We offer well researched information on where to find the top quality diamonds for the best price. The most important factor when buying diamonds is education. It's just like buying a car or a house, you need to do your investigation first before you purchase, which in return will enable you to make the correct choice. This site is focus on providing you with quality information so you can make an inform decision when buying jewelry. Be very aware of the differences between buying diamonds online and buying at a local store. If you read the entire site will get a great idea of why you should only purchase diamonds online. It has so many more benefits it will amaze you. You get the same quality diamonds for literally half the price plus amazing guarantees. We highly recommend buying online as the top choice for diamonds and jewelry. The standards excellent and the price's are much lower then brick and mortar competition. The diamond industry is unlike many other markets, there is very little educational material available, thus consumers normally purchase something that just looks good. Imagine if you bought a house or a car with this mentality, you could be in a lot of trouble. Well buying a diamond is much like this. Thus doing a little research can completely change your decision and enable you to make a quality investment. At the very minimum read the section below on The 4 C's and GIA & AGS Certificates. The Gemological Institute of America (GIA) developed the International Diamond Grading System™ and it is universally used when comparing Diamond quality. When looking for diamonds, the 4C’s is the great method to objectively compare and evaluate diamonds. 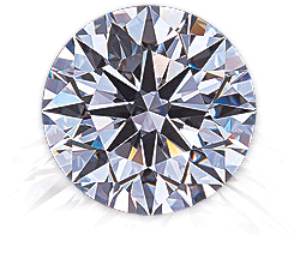 Carat, Clarity, Color and Cut are The Four C’s of diamond quality. They will give you a lot of information about a diamond’s characteristics and value. It is very important to have a good understanding of the 4. The world's biggest diamond, has always been believed to be the Cullinan until recently. The Cullinan Diamond was discovered in 1905 in South Africa. It was named after the owner of the mining company. It weight in at 3,106 carats and was the largest gem-quality rough diamonds ever found. It was cut into 105 gems. Cullinan I, 530 carats is the largest of the cuts and is know as the Great Star of Africa. In 1907 this diamond was given to King Edward VII of England and set into the Royal Scepter. It is kept, along with the other British Crown Jewels, in the Tower of London. 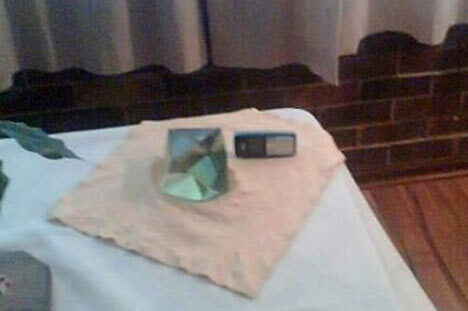 This New Diamond that has been found is said to be twice the size of the Cullinan. It weights in at 7000 carts. It was discovered in the North-West Province of South Africa in an informal dig by a small mining company. There is only one photograph of this so called Biggest Diamond in the World and it was taken by a cell phone. It is a little choppy. Many people in the diamond industry are skeptical of this new find. Maybe because they do not want to see the title of the Cullinan be broken or a little jealous that they did not find it. If it is real, the potential worth is at more than £50 million. Either way, we will all know soon enough which diamond will have the title of THE WORLD’S BIGGEST DIAMOND! The Conflict diamond issue first emerged in the 1990’s. At that time diamonds from the African countries of Angola, Democratic Republic of the Congo, and Sierra Leone were being mined and sold to finance civil wars. The media has given the conflict diamond issue a lot of hype especially since the release of the movie Blood Diamond with Leonardo DiCaprio. 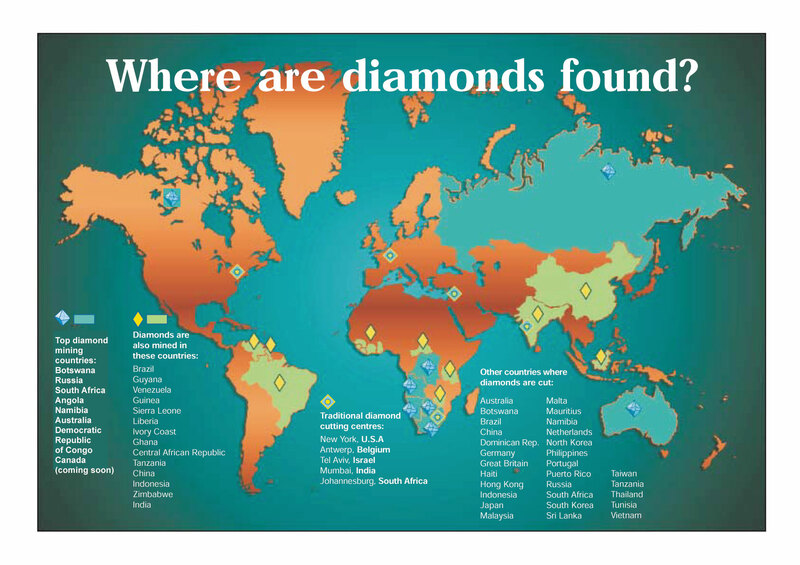 The problem with blood diamonds is actually very small. At the peak of the African civil wars, conflict diamonds only represented a tiny fraction of the world market, around 4%. Those wars have died down or ended and the flow of blood diamonds has dropped with them. • A country that is a member of the Kimberley process may only import rough diamonds from or export to, other participating countries. • When diamonds are transported from one country to another it must be in a tamperproof container. Also, it must have a government issued Kimberley Process Certificate. Today 71 governments have become members of the Kimberley Process Certification System, and have even made it part of their National Law. In today’s market 99% of the world’s diamonds are conflict free. However, just one is Blood Diamond is one too many. So the industry continues to work with governments, NGOs and the UN to help strengthen the Kimberley Process and the System of Warranties. Robert M. Shipley established the Gemological Institute of America (GIA) in 1931. It revolutionized the diamond industry with the development of The Diamond Grading System. Along with their development of the 4Cs it became know as the International Diamond Grading System™. The GIA grading report provides an analysis of quality and authenticity for diamonds. It contains information on diamond shape and cutting style, measurements and weight, proportions and finish, plus provides grades for clarity, color, and cut. It will also identify any known treatments. 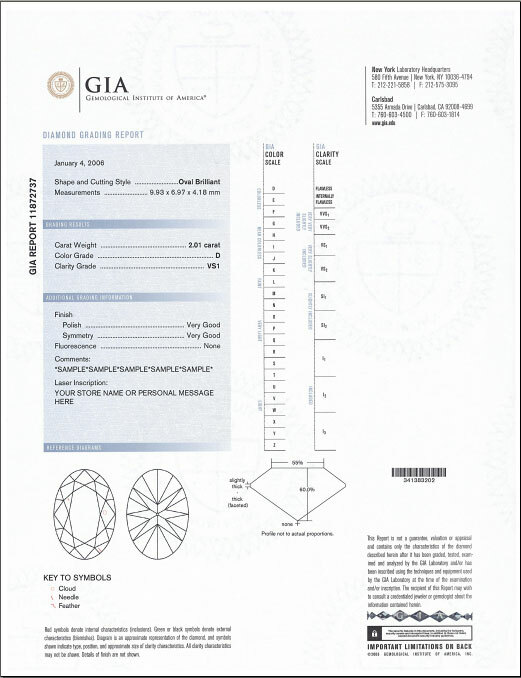 The GIA Diamond Grading Report has earned a reputation for accuracy and integrity. The American Gem Society (AGS) was established in 1996 founded by Robert M. Shipley, who created the GIA. The AGS mission has been to increase consumer awareness and to set a higher standard in the jewelry industry. Their goal is to provide state of the art diamond grading and to have the most rigid standards in the industry. 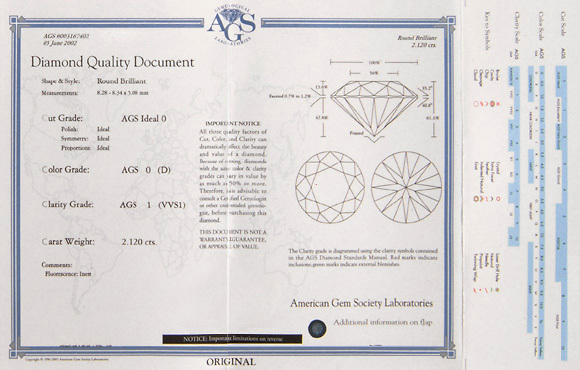 The AGS Diamond Quality Document uses a unique 0 to 10 grading system that is simpler to understand than the GIA’s. It grades color on a numeric sliding scale that is similar to GIA’s alphabetical scale. Clarity is also graded on a simple numeric scale from 0 to 10, as opposed to GIA’s si, vs, ratings. When people learn how to cut diamonds, their goal was to design the very best of quality so they kept trying to create the perfect or The Ideal Cut. In 1919 Marcel Tolkowsky develop the first scientific analysis of a diamond cut. He published it in a small book titled Diamond Design. Tolkowsky who was a mathematician use the laws of physics to calculate a set of proportions that would produce the best optical performance in a round brilliant diamond cut. His family was in the diamond business for many years so he had real life experience as well. He realized from his studies that the proportions being use by the most respected cutters of his time were very close to his calculations. Most experts accepted his analysis and it ultimately became the basis for many of the Ideal Cuts today. In 1950 the AGS adopted Tolkowsky model and made a few adjustments in symmetry and polish to complete their system. In 2006 the AGS create a new system based on light performance, however Tolkowsky's analysis still rates as one of the best in the industry! Diamonds are extremely old! The earth was born round 4.65 billion years ago. The oldest diamond dates back to 3.3 billion years ago. The youngest were formed about 1 billion years ago. Diamonds were created from extreme temperature and pressure. Ranging from 1700 to 2400 degrees Fahrenheit and 650,000 to 870,000 pounds per square inch. To get a better idea of how extreme this is, water vaporizes at 212 degrees Fahrenheit and the pressure on one of the deepest parts of the Ocean Floor is 6000 pounds per square inch. This is at a dept of 13,750 feet, which is deeper than any human has ever explored. Most diamonds crystallize about 90 to 120 miles deep inside the earth’s surface. They form in ancient rocks that are in the core of the continents. This is the one place where ideal conditions exist to develop diamonds. Diamonds are composed of carbon, around 99.95% to 99.99%. They are one of the purest materials found in Nature. That is why they are so expensive and sought after. There is approximately 160 million carats of diamonds being produced each year. The value is about $13 billion at the mine level. A little more then 50% is actually gem quality, which represents about 90% of the total value. The remainder is industrial quality stones used for cutting tools, mining, drill bits, construction and manufacturing. Diamonds of the past came from India dating back to as early as 500 BC. So, for more than 2000 years they were the only producer of diamonds. Around the 1700s other sources were being found in Brazil. They then became the new world leader in diamond production for about the next 150 years. Now diamonds are being mined in about 20 countries. 97% of the world's diamonds by weight and value are produced in eight of the twenty countries. They are Botswana, Russia, South Africa, Canada, Angola, Democratic Republic of Congo, Namibia, and Australia. Five of the top leaders that produce 60% are in Africa, they are; Botswana, South Africa, Angola, Democratic Republic of Congo and Namibia. South Africa is the most senior member of this group. Their first discovery was around 1870 and within 10 years this find caused the global market to increase by 1000%. Also due the heavy competition of this big discovery it gave birth to the organization that shaped the diamond industry, known as De Beers. The discoveries in the other African countries of Botswana, Angola, Democratic Republic of the Congo and Namibia develop in the 1990s. Botswana is largest producer of diamonds in the world. In Angola and the Congo, development has been slowed due to civil wars. Namibia has been experiencing good prosperity and progress. Russia’s first find was in the 1930s was located in the region known as Siberia. They are the world’s second largest producer. The location is very close to the Arctic Circle and mining can be difficult. The winter temperatures can go below -100 degrees Fahrenheit. Canada is called the new kid on the block. Their discovery of 1991 was located in the Northwest Territories. 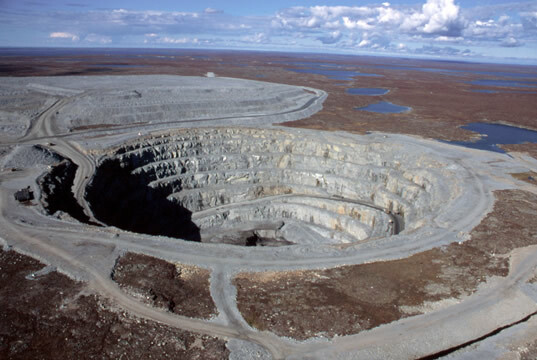 In 1998 the Ekati Mine opened and in 2003 a second dig started in Diavik. Canada is the fourth largest producer. Australia ranks number 8 globally and their discovery was in 1980s. Argyle Mine was developed in Western Australia, they produce a lot of high price fancy color diamonds such as champagne, pink and red. However the remainder of the output is low and inexpensive. Diamonds are brought to the earth's surface by volcanic eruptions. They are transported by magma that originated at great depths of 90 to 120 miles and deeper. This is more extreme that any kind of volcanic explosions than we have ever seen on our planet. There are two types of diamond deposits. They are Primary and Secondary. Primary deposits are areas were diamonds are first brought to the surface by volcanic eruptions. They are known as pipes and the findings are relatively large. Most of the mining is focused through this type of deposits. Secondary deposits are places were the diamonds were carried to the surface by erosion. These findings are mostly small in size and are not worth large exploration. From the beginning of exploration to the start up, the entire process can take more than a decade. The investment can reach well over a half of billion dollars. The Ekati Mine in Canada’s North West Territories is a great example of this. The location was first found in 1981 and it took 10 years of research until the first pipe was located in 1991. Shortly after this, another 120 pipes were locate and only five pipes were selected for development that began in 1997. Diamonds are mined in the most inhospitable areas of the Earth. They are located in the out back of Australia, the deserts of Africa, and the tundra of Russia and Canada. One of the reasons diamonds cost so much is the huge amount labor required to mine a small amount of product. For one point of diamond weight there is over 1000 pounds of ore and rock processed. De Beers now known as the Diamond Trading Company (DTC) has been the primary force in the diamond industry for many years. It was born from heavy competition out of South Africa in the late 1800s. Their mission was to manage the supply and demand of diamonds worldwide. In 1970 the abundance of diamonds found in South Africa caused the price of diamonds to fall, which threatened to ruin the market. In the middle of this crisis Ceil Rhodes developed a plan to control the supply and balance the market. So, Rhodes and his business partners founded De Beers Consolidated Mines in 1888 and by 1990 they owned 90% of the world's diamonds. A few years after Rhodes death in 1902 Earnest Oppenheimer became chairman of De Beers in 1929. Oppenheimer created a structure to manage the flow of rough diamonds to the world market. By 1940 De Beers started working with big advertising firms and developed the theme “A Diamond Is Forever.” Thus diamonds became part of modern romance. Earnest Oppenheimer’s family has been running De Beers since his death in 1957. First his son and now his grandson, Nicholas Oppenheimer, who has been chairman of the company since 1997. De Beers is the world’s largest diamond company. It owns the majority of South African mines and also owns and operates mines in Botswana and Namibia in partnership with their governments. They are also developing a new mine in Canada and exploring other mining opportunities all around the world. 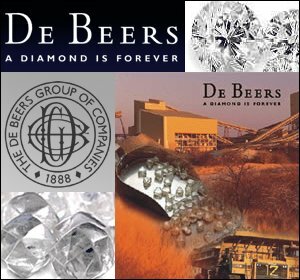 In 2000, De Beers became known as the Diamond Trading Company (DTC), which is now the Supplier of Choice in the global distribution channel. The origin of diamonds emotional meaning has evolved over thousands of years. Their natural and amazing characteristics have inspired the deepest symbolism. The name diamond is derived from the Greek word adamas, meaning unconquerable. Diamonds superior durability led people to believe that it would give them strength, courage, success, and love. Its perfect symmetry symbolizes mental, emotional, and spiritual balance. The clarity and colorlessness were related to peace of mind and purity of the heart. 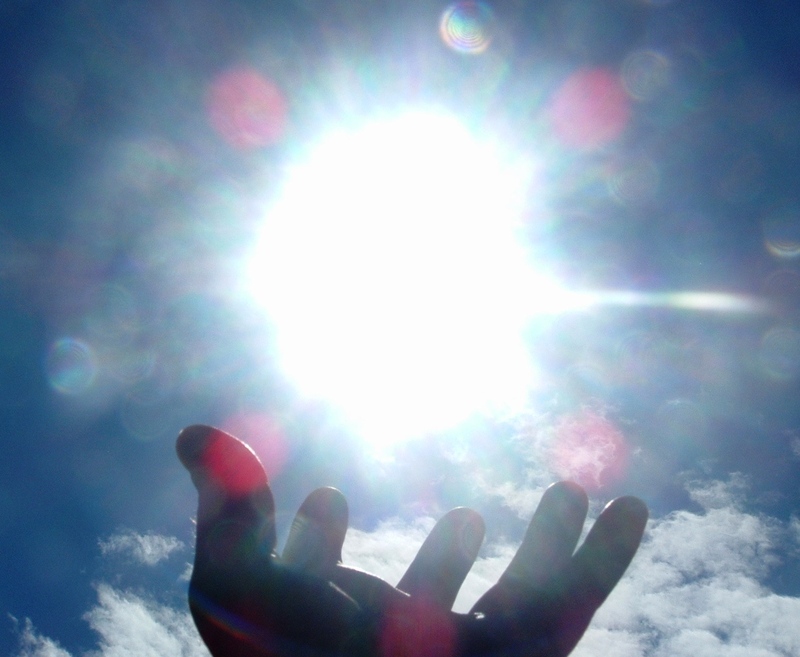 The fire and brilliance are equated with creative energy and enlightenment. Throughout the ages various cultures have their own beliefs regarding the magical powers of diamonds. Ranging from wealth, eternal youth, friends, a happy marriage, and pleasant dreams. Also, they were suppose to ward off evil spirits, raise the dead, make the wearer invisible, signal infidelity, and cure diseases. According to some old legends, diamonds are said to be splinters of broken stars. India’s old belief is that diamonds were born from heavenly rain or lighting. The Romans thought that Cupid’s arrows were tipped with diamonds. Also many cultures believed that the magical powers of a diamond would be enhanced when it was given as a gift. • Make sure you put your diamond jewelry on last when getting dressed. Cosmetics and fragrances such as hair spray can cause damage. • Always take your diamonds off before doing housework, home repair, gardening etc. • Never let your diamond jewelry come in contact with; chlorine from swimming, bleach, cleansers or hot tub water. • If you are wearing your engagement and wedding ring together, it would be a good idea to have them soldered to join as one piece. This will protect them from rubbing against each other preventing the metal from thinning and breaking. • Your diamond jewelry should always be stored in a safe place. You can use the original boxes that came from the jeweler. Or, if you using a jewelry box make sure it is cloth or plush lined. • Never wrap your jewelry in tissue paper, as many people forget and end up throwing it out by mistake. • The most convenient device is a small ultra sonic cleaner, the consumer version. Make sure to buy the cleaning solution that is recommend for your cleaning device. Also, ultrasonic devices can cause damage to other colored gems. Best to only use diamond jewelry in this type of cleaner. • Another method is to use a very soft toothbrush and a mild detergent mixed with warm water, 1:1 ratio. After cleaning, it should be washed with clean fresh water and dried with a lint free cloth. This is the safest method of cleaning your jewelry. Diamonds are extremely durable and tough, yet they still can be damaged if the proper focus is not given to them. So to ensure you have the best looking diamonds, it should be handle, worn, and stored in a certain way. Remember regular maintenance keeps your diamonds looking their best!